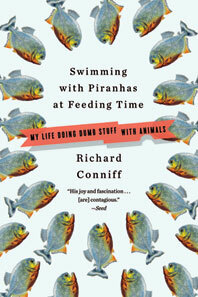 Richard Conniff: India has managed to maintain a population of about 3,000 tigers for decades. What’s the potential population in a nation that’s also home to 1.3 billion people? Conniff Is there any chance that that will happen? 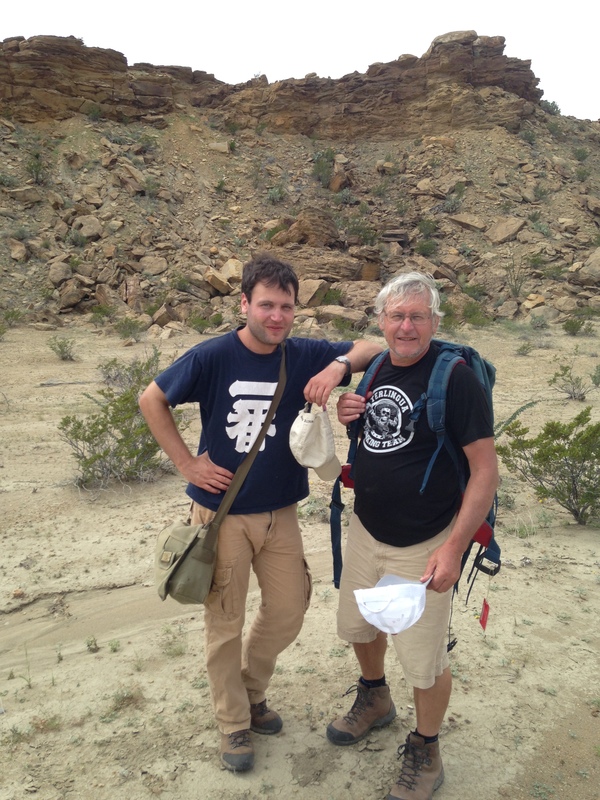 Heading out into the geological layer cake of Big Bend National Park in southwestern Texas, British pterosaur researcher Dave Martill proposes a “to do” list for this brief reconnaissance: 1.) Find a rattlesnake to admire. 2.) “Find a complete Quetzalcoatlus skull sitting on the ground.” The odds are almost infinitely better for item one. But he and Nizar Ibrahim, a fellow paleontologist, promptly fall into a detailed discussion about how to obtain a research permit in the event of item two. This is the first rule of pterosaur research: You need to be an optimist. 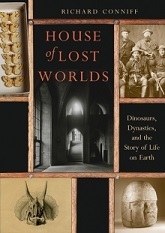 Thinking you will go out on a given day and find any trace of pterosaurs—the winged dragons that ruled Mesozoic skies for 162 million years–is like buying a Powerball ticket and expecting to win. 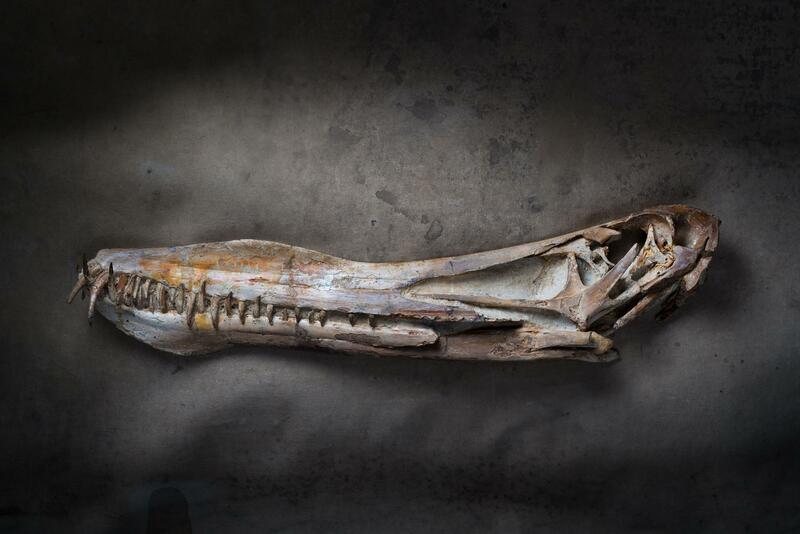 Pterosaur fossils are vanishingly rare. Their whole splendid world, built on hollow bones with paper-thin walls, has long since collapsed into dust. Scarcity is especially the rule for Quetzalcoatlus northropi, thought to be one of the largest flying animals that ever lived, nearly as tall as a giraffe, with a 35-foot wingspan, and a likely penchant for picking off baby dinosaurs. It’s known from a few fragments discovered at Big Bend in 1971, and not much else. Martill and Ibrahim spend three days bone-hunting among the fissured hillsides. They cross and re-cross the promisingly named “Pterodactyl Ridge,” frequently consulting the “x-marks-the-spot” on maps left by the discoverer of Quetzalcoatlus. They decipher the nuances of geological strata (“Look at that Malinkovitch-controlled cyclicity!” Martill exclaims, referring to the way the Earth’s shifting movements show up in the rock), and they conjure up forgotten worlds. On a sandstone ridge with no obvious way down, Martill remarks, “Haven’t found a mountain yet we can’t fall down,” plunges forward, and emerges unscathed below, eyes fixed on the passing landscape. They do not, however, stumble across any rattlesnakes, nor even the faintest whiff of a pterosaur. The femur of an Alamosaurus, the largest North American dinosaur that ever lived, turns up, by way of consolation. But dinosaurs are not pterosaurs, or vice versa. Leaving the park, the two paleontologists are already mapping out a return search for Quetzalcoatlus, permanently hooked on the tantalizing pterosaur mix of extreme biological richness glimpsed through the rarest of fossil remains. With apologies, I have been delayed in posting several articles I published previously this year. Attempting to update now. Thanks in part to an abundance of fossil discoveries in recent decades, scientists now recognize more than 200 species of pterosaur—the winged reptiles that dominated the world’s skies for 160 million years. But almost nothing is known about how they bred or how their young developed. 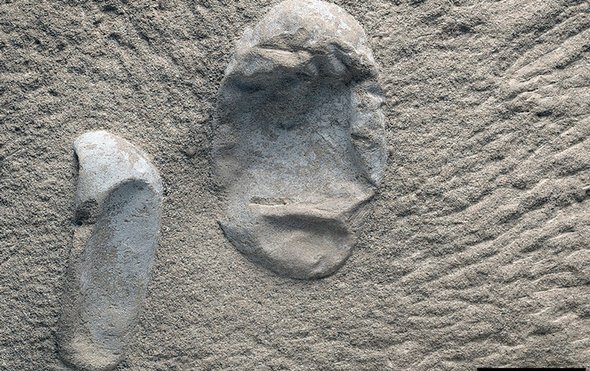 As recently as 2014 the available scientific evidence on those topics added up to a grand total of just three pterosaur eggs, all badly flattened. That dramatically changes with the description in this week’s Science of a sandstone block containing at least 215 fossilized eggs of a Cretaceous era pterosaur, Hamipterus tianshanensis. Many are preserved in three dimensions, and at least 16 contain partial embryonic remains. Get caught smuggling illegal wildlife in most countries in the world, and you can expect a slap on the wrist. A very gentle slap at that. “Somebody could take an AK-47 and just shoot up a pod of pilot whales,” one frustrated investigator recently complained. “That’s the same as a traffic offense.” It’s why wildlife crime has become a $10 billion-a-year industry: It’s safer than robbing the bank. It’s more lucrative than selling drugs. 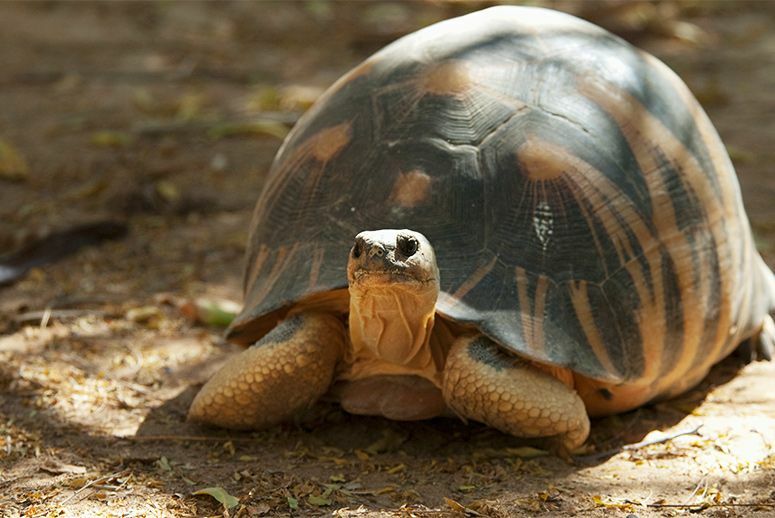 So it should be big news that China, the leading market for wildlife trafficking worldwide, has just handed out jail sentences ranging from 21 months to 11 years to seven defendants caught smuggling hundreds of Madagascar’s critically endangered radiated tortoises. “This sentencing sends a strong message to illegal wildlife dealers that the punishment for these activities will fit the severity of the crime,” said Brian D. Horne, a Wildlife Conservation Society herpetologist who provided expertise to the prosecution. The sentencing is the result of an investigation that began with the 2015 arrest of an airport security worker at Guangzhou Baiyun Airport toting two backpacks containing 316 juvenile tortoises. The animals had come in on a flight from Madagascar, as part of the baggage of Chinese immigrant workers there. The animals were wrapped in tinfoil, a precaution to avoid x-ray detection during transit via commercial airlines. 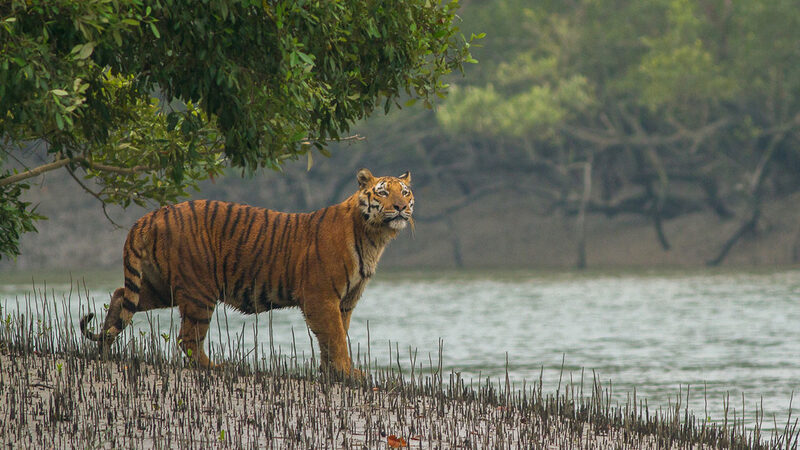 What’s ahead for wildlife in the coming year? Anybody reading the headlines would probably answer: Calamity and extinction. Elephants? Rhinos? Lions in the African bush? Pollinators here at home? None of it sounds like good news. 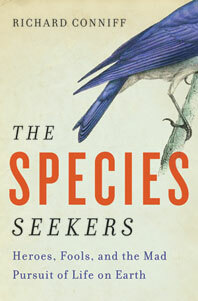 For the past few years, a group of scientists and others with a strong interest in the natural world have tried to look past the headlines and identify emerging conservation issues most people in the field aren’t talking about yet, but will soon. They call it “horizon scanning,” and they try to include opportunities as well as threats. The new list for 2016 is just out in the journal Trends in Ecology & Evolution, and it makes for interesting reading. It is a familiar story in Southeast Asia. In truth, it has become a familiar story almost everywhere: China’s vast appetite for luxury items was the underlying cause of last week’s execution-style killing of two government conservation workers in Cambodia. Sieng Darong, a 47-year-old forest ranger, and Sab Yoh, a 29-year-old police officer, were murdered as they slept on November 7, shot with AK-47-style heavy weapons. A third member of the team survived with injuries, and a fourth escaped. 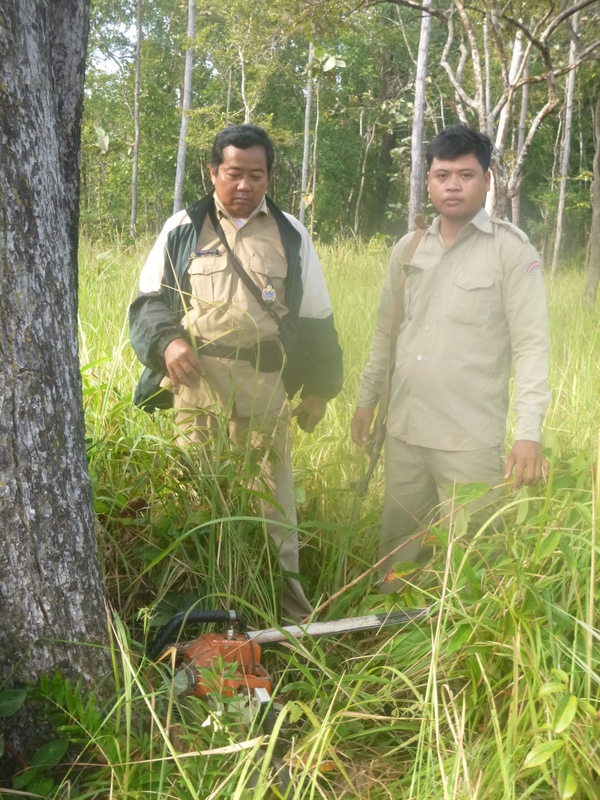 The killings happened shortly after the team confiscated chainsaws at an illegal logging site in northwestern Cambodia’s Preah Vihear Protected Forest. Investigators have arrested six soldiers from the Royal Cambodian Armed Forces on charges of illegal logging in the incident. One of the six has already been jailed to serve a prior sentence of ten years in prison on an old armed robbery conviction. But so far, no formal murder charges have been filed, nor has anyone above the level of foot soldier been implicated in the case. 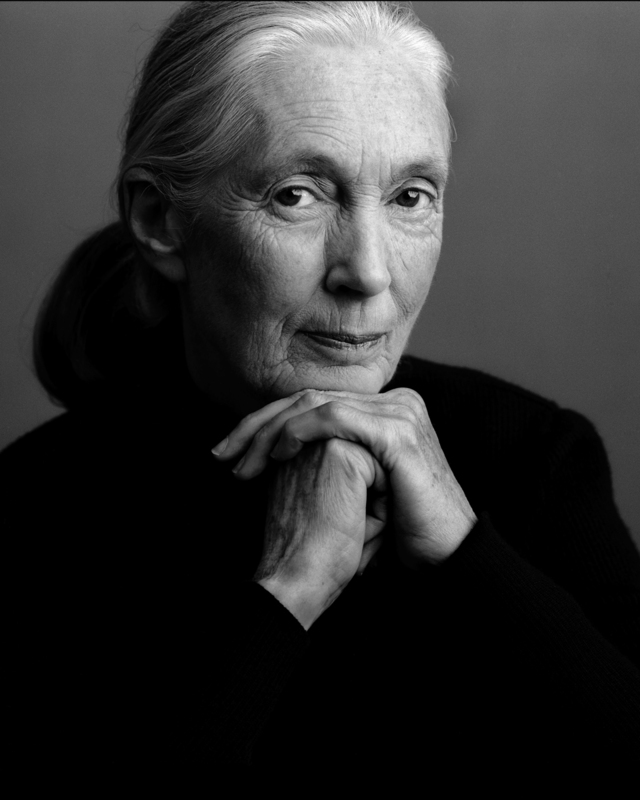 China is exploiting Africa’s resources just like European colonisers did, with disastrous effects for the environment, acclaimed primatologist Jane Goodall has said. On the eve of her 80th birthday, the fiery British wildlife crusader is whizzing across the world giving a series of lectures on the threats to our planet. And the rising world power’s involvement on the continent especially raises alarms when it comes to her beloved chimpanzees and wildlife habitats. During the last decade China has been investing heavily in African natural resources, developing mines, oil wells and running related construction companies. Activists accuse Chinese firms of paying little attention to the environmental impact of their race for resources. A wildlife operation involving dozens of countries and organizations, seized more than three tons of ivory and a bevy of rare wildlife products as well as rare wood. Operatives found rare animals — both living and dead — during the international, month-long operation. The China-led transnational effort, codenamed Cobra II, aimed to crack down on illegal wildlife trade. Authorities recovered over 10,000 live European eels and pig-nosed turtles, as well as over 2,000 live snakes, according to Xinhua, China’s state-run news agency. They also seized three tons of ivory, 36 rhino horns, and over 1,000 hides and skins from tigers, leopards and snakes as well as several hundred kilograms of pangolin scales from wildlife traffickers. 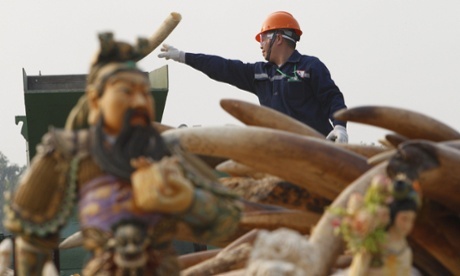 China destroyed a portion of its massive stockpile of confiscated ivory on Monday – a first for the country. The action has left the international conservation community struggling with its own conscience. Whether to praise a monumental shift in approach to conservation by the world’s biggest consumer of the world’s wildlife or condemn the event as posture, devoid of substance and commitment? Before judging, it’s worth examining the situation in a little more detail. Here’s the first photo of the confiscated ivory that the State Forestry Administration destroyed a few hours ago in Guanzhou, China. 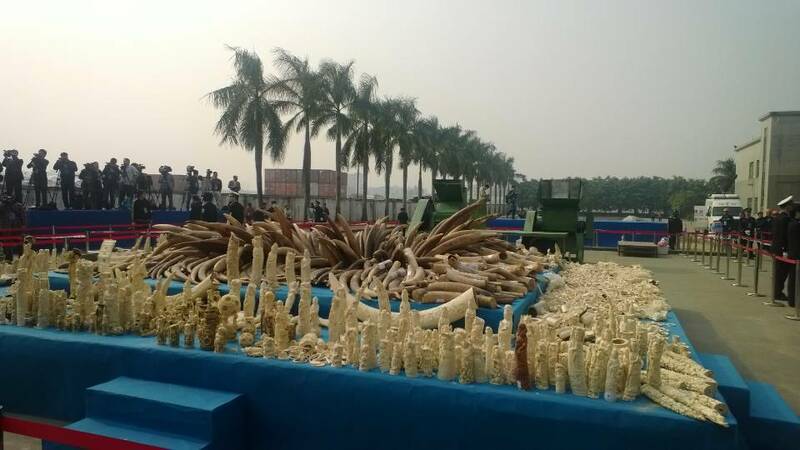 It’s interesting to see the almost floral presentation of the ivory beforehand, and also to note that the amount ultimately destroyed was 6.1 tons, just a fraction more than the United States destroyed in November. Representatives of 10 foreign nations attended, among them three of the countries hardest hit by the continuing slaughter of elephants, Kenya, Gabon, and Tanzania. There was also a certain quality of floral presentation in the praise for China served up by those engaged in the fight against the ivory trade. Saving the elephants, instead of eradicating them, could become a lasting status symbol and win China the admiration of the world. But with 35,000 elephants–almost 10 percent of the remaining wild population–being slaughtered every year, now is the time to take that next step.